Goverment an attack to extermination operation against toward traditional cultur arrangement Moronene people. Just ecomonic interest only. Never to leave Hukaea-Laea village. Never to leave the old land…..
Mr. Disi, one of figure the Moronene people, give her last massage string lace, a time before she’s die, in 1999, an incentive spirit for the old community in Sulawesi Tenggara is strunggle. Until this day, the Moronene people still defences in they land, for half preasure from territory goverment in Sulawesi Tenggara. By way of Operasi Sapu Jagat (The Clearing Earth Operation); the territory goverment to repretion of Moronene people in Hukaea-Laea village, Rarowatu subdistrict, Buton regency, in order to out from the Moronenes land. The operation reason; the area of Moronene people to claim and live must be to concervation, because the Moronene people stay in to Rawa Aopa Watumohai, national park area. The goverment first operation at Friday, Desember 28, 1997. The goverment team by police, militery, forest officer and goverment officer from three regency area (Kolaka, Buton, Kendari) with seven truck go to attack Hukaea-Laea village. Under gun manece, the goverment team will be shot of teen chief of traditional Moronene people if these people not want to out from national park area. Though the Moronene people under gun manece, they not affraid and not to go out from there land. The Chief of goverment team, Saleh Umarella, given command to take away in handcuff for teen chief of Moronene people. The teen chief of Moronene in compulsion to go by truck. An caste to try helped, chase away with guns shoot to people house. After that, the goverment team burning all house in two village. A few national park officer be witness for the goverment team action. Escalation of teror to be high in OSJ-II; Oktober 23, 1998. The goverment team in OSJ-II to burn Moronene people house again. Not only to burning Hukaea-Laea village, moreover for two neigbourhood Hukaea-Laea village; Lampopala and Lanowulu. The Concequence that represive operation; 47 people of Moronene be jail, 298 Moronene house is burn, dan 881 family in four village to evacuated at forest. Material disadventage can be count, because not any wealth can be taked. One of them, Sarapi, die after burning. “We don’t know what happened. Bacause, all of people run in to the forest; at the time, many police officer burning we village,” M. Amin L, the Sarapi brother give information for GAMMA. Whatever, the goverment team action is very cruel, but Moronene people not to moving back. In the land, they to contruction village again, on the eks house burning of them. They to plant agains any garden an destroyed by goverment team. At see the hard attitude of Moronene people, goverment to mad again. Can be to prevent, two day before Ramadhan, November 25, 2000, goverment team back to operation cruel. In this OSJ-III team to strength 80 goverment officer; at terriroty police office (Polda Sultra), territory militery headguard (Korem 143/HO); in coordinated by Land Deputy of Governor (Pembantu Gubernur Wilayah Daratan), Saleh Umarella. Before operation, Saleh Umarella give explained; the OSJ-III not to be like OSJ-I and OSJ-II. “This team in the four village to communicated only at that area must be guard because TNRAW is very important area as concervation regions,” Saleh says. At Saleh explain of the goverment operations make the Moronene people be cheerful. By the way, the goverment operation an explain by Saleh Umarella not be come peace. People warm reception to get cruel response form the goverment team; 28 people house to demolish by use five cutting tree mechine. Many people can be do anything to see they house to demolish. But, several Moronene people try to contact Non Goverment Organization (NGO) community in Kendari and Jakarta to tell the cruel actions of the goverment team. Head of Campaign Division and Lobby, National Executive of WALHI, Longgena Ginting, Monday, November 27, 2000, to on take place from Jakarta to Kendari. With Executive Director SULUH Indonesia Foundations, Haris Palisuri—with two staff helped—and few jounalist, Longgena to on take place in Hukaea-Laea village. Haris Palisuri to explained; the territory goverment of Sulawesi Tenggara try to do genocide (a rasial destroyed) practice, with to destroy drasticly way of Moronene traditional culture and Moronene people too in represive and radicalism action. “The goverment team attitude is very to hurt of Moronene traditional community hearts,” Haris says. For Longgena Ginting that action definitly to way out of unanimously betwen two Moronene, Mansyur Lababa and Mother Vera, and few departement official linked together in meeting of Jakarta and Kendari. With SULUH Indonesia Foundations mediation and WALHI, in Oktober 17 – 20, 2000, Mansyur and Mother Vera already to meet Minister Erna Witoelar, Director Jenderal of Region Otonomy Mr. Mangara Butar-Butar, and Mr. Widodo from Directorat of Natural Conservations, and National Commision of Human Rights of Indonesia. Two of Moroenene be report to central goverment in Jakarta to give warning the territory goverment, Sulawesi Tenggara on the cruel actions, and Moronene people can get their acknowledgmant to right and traditional on Hukaea-Laea village an to territory goverment burning. Mr. Mangara to promise will be called the Governor of Sulawesi Tenggara for explained their (territory officer) cruel action; and to explain an the true paradigma about traditional community presence in national park area. Mr. Widodo be explain about organizer paradigma to national park with the people around. The National Commision of Human Rights see the goverment team action as harm unconstitutional of human rights by territory goverment of Sulawesi Tenggara do it action on the name of conservation. But, spokesman of the human rights commision, Nur Anwar, the repretion of Moronene people be happened bacause the territory goverment still the economic interest be in there (national park). The territory goverment to opened the Kapet Bukari or Economic Building Unity Area of Buton—Kolaka—Kendari in national park area. “The Kapet Bukari expanstion be closed purposely, an be reason when the Moronene people to drive away is a conservation reason only,” Nur Anwar explained. But, the Minister Erna Witoelar says; the Kapet Bukari not to be change the local economic actor with outsider economic. “Is not true to opening the KAPET, so many people and community at around must be drive away,” Minister Erna says. Another opinions comes from Longgena; the Moronene traditional people is a national asset, cause the traditional community to played in everytime to natural source conservation in national park area. The Moronene people is still stay of there land from generation to generation. This community must be integrated with national park ecosistim. Problem is be pile up, because goverment policy with a represive action for Moronene traditional people to wolk together, and to be hidden behind conservation issue it is trick target only. “The inportant target; the territory goverment want to take away the lands function and used economy area concept,” says Longgena again. At the time, Head of Public Relations Bureau of Territory Goverment Sulawesi Tenggara, Amir Manab on a scale not ceriously to talk about the Moronene people burning case. Amir says; an everything of territory goverment doing, that is a standard procedur. Amir to informated for Moronene people will be give 700 hectare land out from their village, in national park. “The new land will be as new village for Moronene people,” Amir explained. So, why the territory goverment used radicalism and represive actions? Amir Manab can be to answer this questions. Governor of Sulawesi Tenggara, La Ode Kaimoeddin, to make sure the territory goverment not mean the Moronene people to drive away from there land. “This time many more commers from unknow territory, come and stay in national park, for half the commers can not Moronene people,” Kaimoeddin reason. Kaimoeddin to opened data; from 234 people caste of Hukaea-Laea, only two person to have a Moronene historical etnic. Where as Lanowulu village, from 200 person, only seven is still know have the Moronene historical. The governor to be sorry for WALHI attitude an keep to support the Moronene caste to stay in national park area. But, Kaimoeddin data’s to WALHI and SULUH Indonesia be quarred. This two biggest Environment Organization to use sigh language if the goverments data is false for to strengthen principle of act to underestimate of human rights in goverment operations. “The Moronene traditional people presence can be quarrel. This is the old community, so that the Moronene people must get a confession and the same behavior in the international of human right rules,” Haris Palisuri to confirm explain. SULUH Indonesia Foundations and WALHI to support teamwork with eight national NGO; Elsam, YLBHI, Amatra and to made local networking in Kendari for to stan the territory goverment represive act to the Moronene community. The NGO networking to arrange accusation in court, to claim the motivator and executor the OSJ-I, OSJ-II and OSJ-III. Mr. Arnold Baramuli presence not to suprised for Sulawesi Tenggara (southeast celebes) people. After presence in September, 1989, Baramuli seing favoureble factor in there. Before, Sulawesi Tenggara is still as Golkar maining of votter elections. And, Baramuli to claim him self be same with east Indonesian people. In a television interactive dialogue she to throw a statement; if people in east Indonesia region see him in television, course to be choose Golkar; she’s political party. In the people eyes, Baramuli be full charisma like that? Arbab Paproeka, Vice Chief of Partai Amanat National (National Mandate Party) Sulawesi Tenggara to appraise Baramuli want to eksploitate people in east Indonesian region with to personification him self. Baramuli styles in Apel Akbar (big campaign party), Friday, Fabruary 5, 1999, is not to change people opinion about Golkar attitude in last time. Many political observer to regrat country workers mobilitation and used car goverment facility for carry on hundred young man. For everyone of them, Golkar gived 15.000 rupiah. Amaluddin Political observer from University of 45, Ujungpandang, says; country workers mobility and money politic by Golkar not to good solutions for want the people simpaty. Amaluddin pupposely come to Sulawesi Tenggara for following Baramuli “political moving”. “Mr. Baramuli to forget of reformation spirit and people still believe shape of Golkar political the last time. The reality of Golkar political; Baramuli to be in the process of straggling the new political rule who Habibie’s goverment try to contructed,” Alimuddin say. So far away, Alimuddin to increase; goverment to comfirm explain in Goverment Rule number 5, 1999, in point 3, about a netraly country workers position and do not use goverment facility for campaign any political party. The else paralel rule; Goverment Rule number 12, 1999, point 7:1, about if country workers as still political party member so they position in goverment structure can be otomaticly expire. “Than is disregard to goverment policy. The mobilitation of country workers for add the campaign party is still maximal used goverment facilities,” Alimuddin given out of rule of Golkar sample. Mr. Baramuli is now to involved conflict with Barnas (National Troops) Group—Ali Sadikin and Mr. M Kemal Idris cs.—to consequences she’s statement in Palu, Sulawesi Tengah, November, 1989. Mr. Baramuli not to burden for that. “The Palu problem is a small thing,” Baramuli say. The conections betwen “start stollen” campaign and Baramuli statement about east Indonesia region must be derly. The Golkar by way of Baramuli to used President Habibie positions for get simpaty struggle of east Indonesia region people. Golkar must to be able to a eight of voice votter target in every area elections. And Golkar must be hard to work for that. Baramuli optimistyc is followed vice exchequer DPP (Centre Leader Element) Golkar, Setya Novanto. Novanto says; people must be concius that Golkar with development as still identicly. That is means, the govermnet to contructed Golkar in eks Presiden Soeharto goverment not to take over by any political party. “The reason is we to development and begining the political rule in this country. I thing anything else political party can be following the political ritme of Golkar. If than be try, Indonesian development can be hampered slewed down,” Novanto pesimistic. Two last week, Kendari city very to grasp. Every corner in this town, at night, caste to be on one’s guard. Not to except police officer. The police can be shot everytime. But not for to wipe out criminals or provocator one political insiden. An target to be shot by policeman are wild dogs, cats and monkey an assumption rabies virus infected. The animals often to bitten any people. The bitten victim already to fall. Until the hospital can be to patch many victim again. Some else victim, Agussalim, 13 year old and Nirmalayati, 21 years old, to die bacause this rabies virus. Ironicly, two victim of there can be hospital helped, because paramedic to late given them antirabies serum immediatly. After of two victim died, still 18 people else to identification attacking this virus; includ one babies. This data not yet includ many victim in a few subdistrict area of Kendari city; Aundonouhu, Konda, Soropia and Asera. “The paramedic team still to count totally victim. But the victim prosentase still a small, if comparison rabies attack data in 1992,” dr. Nuriamin says. Nuriamin is Chief of Contaqious Endemic Prevention, The Healty and Social Departement, Sulawesi Tenggara. The Major of Kendari city, Masyhur Masie Abunawas; to hurry up form a team to clearing this rabies endemic. Every people in town an to propess the dogs, cats and mongkey; to request vacsinated them animal sun from that deadtly virus. After that, a preventive actions from goverment team; shotting, anasthetization, and poisoning at many wild dog, cat and mongkey. Goverment resolute to people in town; called this issued too. This called issue for every people in town not to follow the torbited. The exterminate intruction from major in acsepted more community in four satelite area in the city. Every people in town must to guarded they area averytime for antisipation to victim by dogs attacking again. The resulted, many dog without owner die. The dog corpse then be graved. Be half, the goverment policy and community responding not to followed. Healhty and Social Departement and Edy Sabara hospital responded. The complain from people to hightly price for antirabies serum do not serriously responsive. But, sinyalement to guarred by dr. Izat Manarfa, Chief of Healtly and Social Departement in Sulawesi Tenggara. Manarfa says; “We not to responsibility yet. 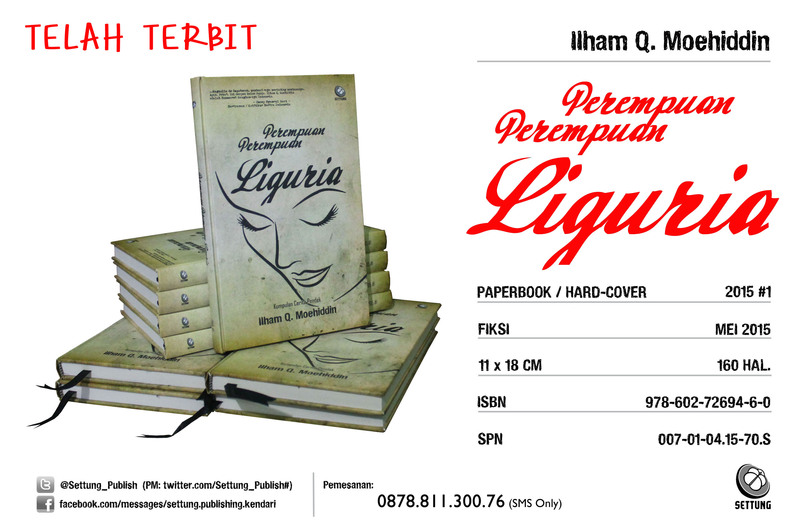 That serum price it still expensive and limited quantity”. Manarfa tell about antirabies serum not to many production; a half material to imported too. And people must to pay 450.000 rupiah for every injection. The pharmacy shop owner to confess a limited antirabies serum in the market. They confess not to already many serum stok. But, the reason of pharmacy shop owner; because rabies case very wide apart. “I thing, we can be do it to still manymore serum, because that serum very hightly price,” say the Alfa Zero Farma owner, Delfy Mangesang. The antirabies serum usefulness not permanently. So, not to be tottaly recovered for a petient too. Manarfa say; the serum quality to preventive only. The rabies virus still stay in petient body and will infected the petient countinully for they all live. “Because, a rabies virus like is paracite and still infected any person where this virus to grow. This serum not to recover; serum just be hold the virus only,” Manarfa explain. In Sulawesi Tenggara, the percentation of all victim die more low 0,8%; be half in incident in 1992 an 14 people die by this rabies virus. The crazy dog bitten fo all will be found a great stimulate two days after bitten. In the first indication; victim will be high fever, and the last stadium, they will be change of action look like a crazy dog; never stoped salive to drip. PERILAKU Cracker (orang yang masuk ke sebuah situs untuk melakukan sesuatu yang merusak) makin membuat kehidupan ini tidak nyaman. Pada tanggal 17 April 2004 situs KPU diacak-acak orang. Nama-nama partai diubah menjadi lucu-lucu. Namun data angka tidak ada yang terusik. Dan, pada Kamis (22/4) , pelakunya, Dani Firmansyah, ditangkap polisi. Perlu beberapa hari sampai polisi mau mengumumkannya ke publik hari Senin kemarin. Dan, beberapa jam setelah Dani diumumkan sebagai tersangka, crackers lain yang merasa senasib melakukan pembalasan. Beberapa situs penting Indonesia dirusak. Saat berita ini diturunkan pukul 22.30 WIB, paling tidak situs resmi Sekretaris Kabinet (www.setkab.go.id) yang sudah pasti rusak. Di situs ini pula, perusak memasukkan pesan untuk pembebasan Dani. Kejahatan alam maya ini memang kejahatan baru bagi polisi Indonesia, bahkan dunia. Kejahatan alam maya memang belum banyak jenisnya, namun pelacakannya butuh orang-orang ahli di bidang ini. Untuk kasus perusakan situs KPU ini, polisi Indonesia bekerja sama antara lain dengan Asosiasi Penyelenggara Jasa Internet Indonesia (APJII). Asosiasi ini memang harus dilibatkan sebab banyak data lalu lintas internet diketahui mereka. “Perilaku crackers sudah mencemaskan. Siapa pun boleh beranggapan bahwa kerja KPU kurang maksimal. Tetapi itu bukan pembenaran untuk merusak,” kata Heru Nugroho, sekretaris APJII, menanggapi ulah para perusak alam maya itu. PELACAKAN untuk menangkap Dani dimulai polisi dengan mempelajari log server KPU. 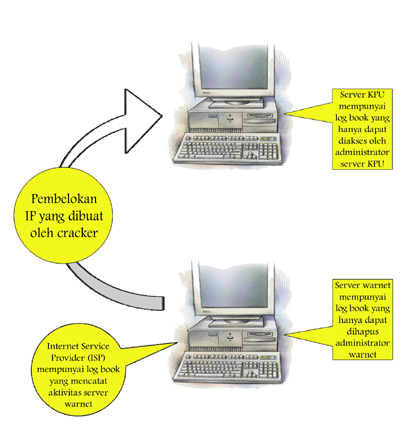 Untuk mempermudah kerja, hanya log server tanggal 16 dan 17 April yang diteliti. Itu pun tidaklah mudah sebab pada tanggal 16 April ada 361.000 baris data orang-orang yang masuk ke situs KPU ini. Lalu, pada tanggal 17 April saat sang cracker beraksi itu, ada 164.000 baris data tamu. Dari penelusuran ini, terlihat bahwa penggantian nama-nama partai di situs KPU berlangsung pada tanggal 17 April antara pukul 11.24 WIB sampai 11.34 WIB. Penelusuran juga mendapatkan dua buah nickname pelaku yaitu “xnuxer” dan “schizoprenic”. Nickname ini walau hanya nama samaran, pada dunia maya sering mewakili satu orang yang pasti. Dan pelacakan pun dimulai dengan nickname ini. Kesulitan pertama langsung terlihat bahwa pelaku telah melakukan “penyesatan”. Terlihat seakan pelaku melakukannya dari Thailand dari alamat IP (Internet Protocol) 208.147.1.1. Polisi dan timnya tidak menyerah. Mereka melacak kegiatan nickname-nickname tadi dari berbagai cara. Suatu ketika, saat tim melakukan chatting (ngobrol tertulis di jalur internet) lewat jalur IRC (Internet Relay Chat), terlacak bahwa si schizoprenic terakhir terbaca melakukan chatting dari sebuah warnet di Yogya. APJII yang mempelajari log book warnet itu mendapati kejanggalan besar, yaitu log book warnet itu kosong melompong pada tanggal 17 April saat situs KPU dibobol orang. Dugaan pertama adalah, pada tanggal 17 April itu sang warnet tidak beroperasi. Namun, dari pelacakan lebih jauh lagi, yaitu dari Internet Service Provider (ISP) tempat warnet itu tersambung, yaitu UII-net, terbukti bahwa warnet itu tetap buka normal pada tanggal 17 April. Hal pertama yang patut dicatat adalah, log book warnet hanya bisa diubah-ubah isinya oleh admin sang warnet itu sendiri. Dan, sang admin warnet itu ternyata telah memberikan previlage itu kepada orang luar, yang ternyata akhirnya terbukti Dani Firmansyah. Sang admin menganggap Dani sebagai “gurunya” dalam bidang tehnologi, maka ia memberinya hak untuk bisa masuk berbagai akses vital warnet itu. Jadi, Dani melakukan perusakan dari Jakarta tetapi dengan “memperalat” warnet di Yogya itu sambil mengalihkan perhatian orang ke Thailand. “Dia cukup canggih walau otodidak,” kata seorang pakar tehnologi informasi. HAL penting yang bisa dicatat dalam peristiwa ini adalah bahwa manusia sampai kapan pun punya kencenderungan pamer. Seorang cracker pamer kemampuannya dengan merusak situs-situs penting. Dengan kata lain ia ingin berkata bahwa ia lebih jago dari pada perancang atau penjaga sang situs. Situs http://www.setkab.go.id juga telah rusak, bahkan yang merusak memasukkan kata ini: “Bebaskan Om Schizoprenic” alias ia meminta pembebasan Dani Firmansyah. Gejala apa pula ini? Kalau sempat KPU kacau-balau, kacau pulalah sebagian negara ini. Dan para crackers masih menganggap Dani harus dibebaskan! Kesombongan para crackers telah menutup mata mereka sendiri akan kenyataan bahwa merusak kepentingan orang lain adalah kriminalitas. Sampai sekarang pun masih banyak orang yang bangga kalau bisa berbelanja di internet dengan mampu membobol kartu kredit orang lain. Ribuan orang muda Indonesia masih merasa bangga kalau bisa membobol internet. Dalam benak mereka itu kehebatan dan kecerdasan, bukan pencurian.